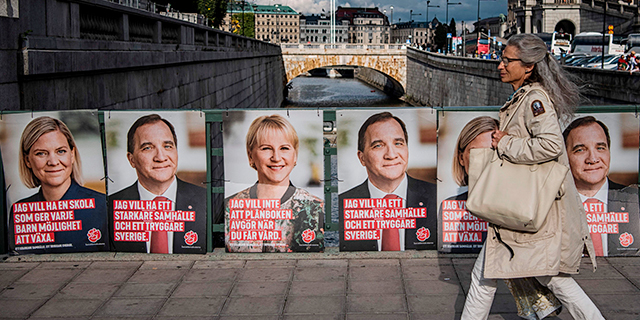 Sunday’s general election in Sweden extended two trends that are now prominent across Western Europe: the rise of right-wing populist parties and the decline of center-left parties. The far-right Sweden Democrats entered parliament for the first time in 2010, winning 6% of the vote. On Sunday, they finished in third place with 18% of the vote. And while the center-left Social Democrats finished ahead of the Sweden Democrats, they registered their worst electoral performance in more than 100 years. Sweden’s Social Democratic Party is not an anomaly. In legislative elections held over the past two years, the French Socialist Party, German Social Democratic Party and Dutch Labor Party – three other major left-of-center parties – recorded their worst-ever results in the postwar era. 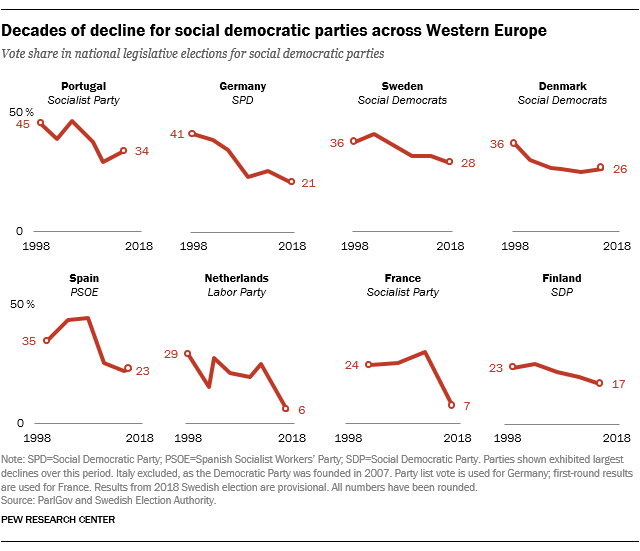 Once-strong center-left parties in Austria, Denmark, Finland, Norway and Spain are also near historic lows in terms of their most recent legislative election results. Not all social democratic parties are suffering historic defeats. The UK Labour Party won 40% of the vote in the country’s 2017 general election, roughly matching the performances the party turned in under Prime Minister Tony Blair (a member of the party) in 1997 and 2001. But most center-left parties in Western Europe are in a weaker position than they were two decades ago. Observers have suggested a variety of reasons for the decline, some of which are specific to individual countries. In France, for instance, many pin the collapse of the Socialist Party on the party’s onetime standard bearer, former President François Hollande. His term was marred by unpopular economic reforms, deadly terrorist attacks and personal scandal; his approval dropped as low as 4% in the final months of his term, according to one poll. The fall of France’s Socialist Party disrupted the two-party system and cleared the way for new challengers across the ideological spectrum, including current President Emmanuel Macron. In contrast, the German Social Democratic Party has trended downward for decades. Its vote share declined in 2005 after then-Chancellor Gerhard Schröeder (a member of the party) made cuts to the social safety net. The declines continued through the financial and refugee crises and two coalition governments with Chancellor Angela Merkel’s center-right Christian Democratic Union (CDU). The coalitions left voters without a clear center-left alternative to the CDU, and many defected to parties across the political spectrum. Center-right parties in Western Europe have generally not experienced similar declines. Sweden’s Moderate Party, for example, won 23% of the vote in 1998 and 20% this year. The Finnish National Coalition Party has also held relatively steady, dropping only slightly from 21% of the vote in 1999 to 18% in 2015. Moreover, it has won a larger share of the vote than the Finnish Social Democratic Party in each of the country’s last three elections, something it had never done before. Due to the decline of the center-left across much of Western Europe and the comparative steadiness of the center-right, most Western European countries are led by center-right parties, as measured by the party of the prime minister or other head of government. Two countries, Italy and France, are governed by relatively new parties that eschew traditional left-right characterization, though both have pursued agendas that experts generally place right of center. 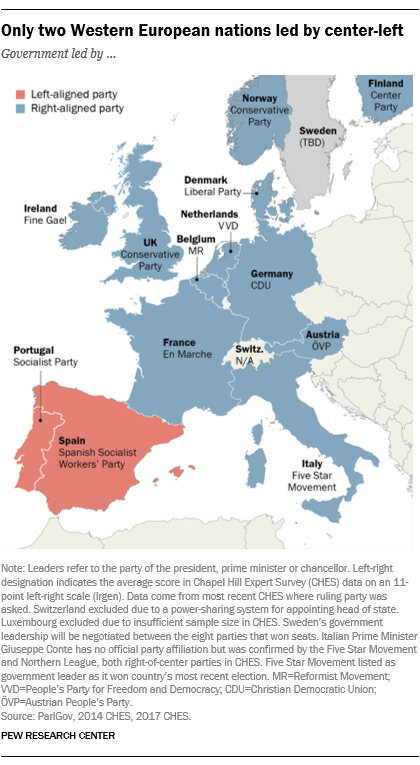 Only two countries are governed by the center-left: Spain, led by the Spanish Socialist Workers’ Party, and Portugal, led by the Socialist Party.